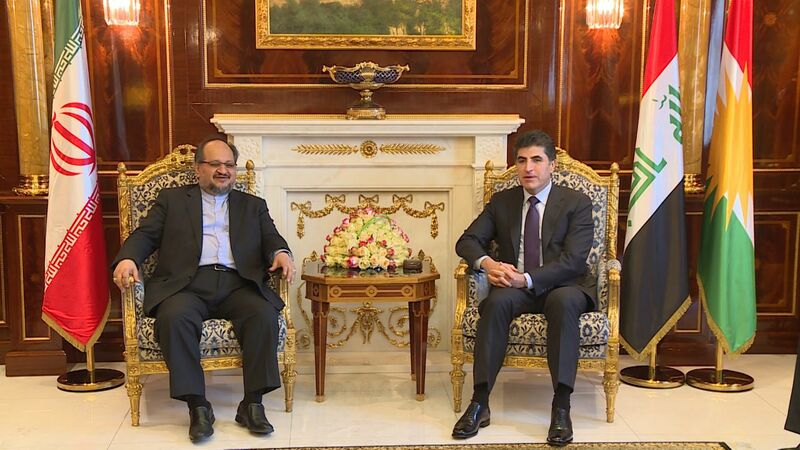 They expressed satisfaction with their visit to the Kurdistan Region and participation at the conference which was held in Erbil on the development of economic relations between the Kurdistan Region and the Islamic Republic of Iran.They highlighted the historical relations between the Kurdistan Region and Iran and expressed their willingness to further strengthen and develop these relations, particularly in the industrial, commercial and other economic fields. The delegation commended the Kurdistan Regional Government for the steps towards normalization of the relations between the Kurdistan Region and Baghdad, which led to the settlement of some of the differences between the two sides. They stressed that Iran desires full stability in the region. Prime Minister Barzani thanked the Islamic Republic of Iran for its assistance to the Kurdistan Region in difficult periods, and expressed the readiness of the Kurdistan Region to strengthen relations with Iran, particularly in the economic field. He stressed that the Kurdistan Region and Iraq wish for economic stability in the region and that Iran, which has rich experience, can help Iraq and the Kurdistan Region. Prime Minister Barzani thanked the Iranian delegation for participating in the conference on the development of economic relations between the Kurdistan Region and the Islamic Republic of Iran. He also thanked Iran’s Ambassador to Iraq, the Consul General to the Kurdistan Region and all the parties who contributed to enhancing bilateral relations in various fields.